I recently returned from Austria, where I attended the opening of a beautiful exhibition at Vienna's freiraum quartier21 International, MuseumsQuartier, curated by Jozef Cseres and Georg Weckwerth. MEMBRA DISJECTA FOR JOHN CAGE: Wanting to Say Something About John, one of the countless events taking place worldwide in celebration of Cage's Centennial Year, is an homage to the composer, featuring the work of some 60 diverse artists working in diverse media from around the world. There were so many fantastic pieces comprising this show, it's impossible to do justice to them all. Happily, the website coverage via the link above is fairly comprehensive. But I want to give special mention here to a little-known Czech composer, Tomas Vtipil, whose latest work, Scattered Members (2012), was performed as part of the exhibition's opening events by Mr. Vtipil himself and Brno's celebrated Laska Opravdiva (a choir particularly renowned for its renditions of Janacek). The work is scored for ambulatory male choir and electronics, and is, in the end, an absolute celebration of the impossibility of singing in tune against a real-time remix of what's just been sung: three different anthems sung by three different groups of singers who walk amiably throughout the museum, captured all the while by Mr. Vtipil, sitting quietly at his computer. It was a beautiful, surprising, and heroic performance of a work that I think adds an interesting and vital dimension to any ongoing conversation about the nature (and viability) of harmony. I also think Cage himself would have enjoyed it immensely. Mr. Vtipil has an extremely modest presence on the Web (and what's there is mostly in Czech), but you can view his profile on Facebook and you can order his latest recording (vinyl) here. Exciting stuff! 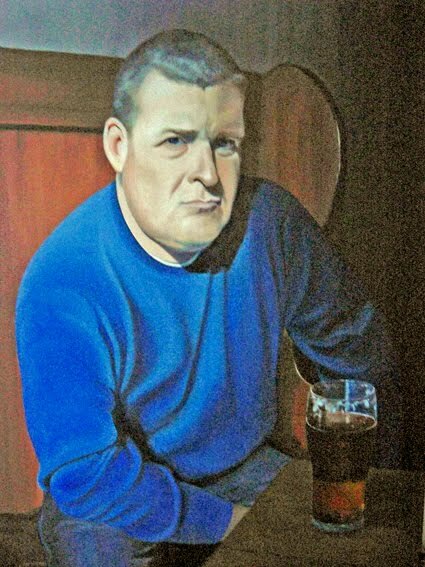 Another really memorable work in the exhibition is by one of New York's own: Robert Ashley. It's a letter really, parsed across eight double-spaced, typewritten pages, entitled simply The Influence of John Cage (2011). The curators elected to show this work in an unassuming, upstairs space, and had affixed its pages to a small glass wall, quite low to the ground. So that in order to view (and/or read) it, one had to sit on a small tufted pillow that had been placed squarely before it, on the floor. I was very taken with this piece, for at least a dozen reasons, and thought about it often during my remaining days in Vienna. Upon my return to New York, I quickly wrote to Robert Ashley, asking if I might include it in a blog. He kindly agreed. What follows is his contribution to MEMBRA DISJECTA FOR JOHN CAGE: Wanting to Say Something About John, in its entirety. It appears here, as in the exhibition, entirely without frills. 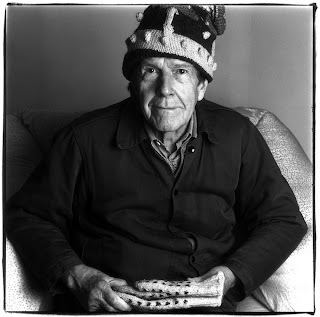 It is reasonable to ask any composer of my generation how much influence John Cage had on his/her music, because, with Silence, Cage wrote, arguably, the most intelligent and influential book on music theory in the second half of the twentieth century and because, on the basis of his ideas and his personality, he became such a celebrity. He became a celebrity for many important and admirable reasons. He became a celebrity because contemporary music had a political power in the nineteen-sixties that it has lost now, and he was its best-known composer. I don't think anybody is a celebrity now or will be a celebrity in the near future on the scale that Cage was a celebrity in his time. And he was a celebrity because he and David Tudor brought to America ideas from Europe that were not available in any other form -- scores, readings, first-hand experience or gossip -- particularly ideas about serialism and the many proponents of serialism among European composers: Stockhausen, Berio, Boulez, Pousseur, Nono, Maderna, Nilsson and many others. These ideas were especially important to those of us who were unable to go to Europe and learn for ourselves. Cage and Tudor traveled extensively giving duo-concerts and as musicians with the Merce Cunningham Dance Company. And it appears that wherever he went Cage gave interviews to answer questions about "chance operations" as they applied both to music and to dance. Many of those interviews have been published. John Cage and I became and remained good friends, especially in his later years when Mimi Johnson was managing his concert affairs and we were together a lot. To go back for a moment to celebrity, I find it curious that younger composers now seem to think of Cage as simply one part of "the past." For them the past is bigger and includes more people. I think many young composers and fans of new music are interested now in the nineteen-sixties, and I encourage every person I speak to about the nineteen-sixties to read Silence, because it is one of the great theory books and its presentation is so original and convincing. But Zen Buddhism and mushrooms have been replaced in America's continuing fascination with "the other" by something else -- probably, now, power and money making. So Cage seems not as important now as he was a few years ago. As much as I liked much of Cage's music -- most of it -- and as much as I admired Cage, I don't think of myself as seriously "influenced" by Cage. I didn't think that his ideas applied to what I thought I wanted to do. For instance, I think he never understood or was not sympathetic to "timelessness" -- the hard-to-explain root of the almost-impossible-to-explain "drone" concept as it was coming into practice then. In connection with the idea of the "drone," in the late nineteen-sixties Cage began working on a series of pieces, sometimes going under different names, that started, I believe, with a piece called MusiCircus. The idea of MusiCircus was to gather together all of the musical performers or performing groups in the locale and have them play all at the same time, arranged next to each other, in a large performance space. From a distance or outside of the room it was, of course, a kind of drone, but I don't think that is the way Cage thought of it. I believe he thought of it -- in a way that I probably could not explain to his credit -- as having something to do with "chaos," which was much in the intellectual news at that time. The problem with the MusiCircus piece, for me, was that from any place in the room the listener was always near enough to one of the performances that the performance heard was simply an old-fashioned kind of thing -- a rock band, a person playing Mozart on a harpsichord, a drum and bugle corps, a choir -- clearly doing well-known music in the midst of chaos. I heard many performances in different places and I never liked the piece. And he probably would not have liked my graphic notation -- if he saw any of it -- however it differed from his in principle. Clearly Cage was the pioneer and champion of graphic notation. He was interested in making other kinds of music that could come from graphic notation. But I don't think he got the idea of the "drone" -- which is possible to diagram only in a special kind of graphic notation. And I thought he was more interested in the graphic "elegance" of the score than in the notion that the score could be some sort of "puzzle" that would set the performers on an unknown path. He certainly understood "conceptual" music. He certainly understood the implications and applications of electronic music. In his work such as Indeterminacy and in the solo readings of the "Mesostics," we heard (or could not hear) story telling, but at its root it was still concerned with unpredictability on the time scale -- speaking too fast, speaking too slowly, speech buried in noise. When I studied Cage's graphic notation, I always found in it simply another way to write linear, time-line music. I am not an expert in Cage's music, but I think that I am not wrong. Complete non-eventfulness or music that was not based in eventfulness, but in some other kind of formula, was not something he inherited in its inception. He was strangely "out of touch." Once, I suggested to a close friend of Cage the possibility that there might be somewhere in Cage's effects a master notebook of "chance operations," a huge list of numbers or orders of numbers that could be applied to any parameter. Because it seemed sort of silly to me that every time Cage began a new piece he would work the I Ching or throw the dice again. (After 1984 he started using computer programs, but as far as I know the programs still produced "chance operations.") I was only partly kidding, saying that such a "master plan" would in no way change the fact of the composition being based on chance. The response was indignant outrage. "Chance operations" was a masterpiece of public relations in addition to being a good way to compose music. Everybody thought they understood chance operations. So we got a lot of pieces based on chance operations. Cage was an amazing composer. Atlas Eclipticalis, Etudes Australes, the music for prepared pianos, the Concert for Piano and Orchestra, Winter Music, the Freeman Etudes and many others are giant music. Someday they will enter the general repertory. It is only too bad that they weren't done well or weren't done at all during Cage's life -- so that he could have heard them. So, yes, I was influenced by Cage. We are all influenced by celebrity. It is like fashion: everybody does it and somebody gets the credit. The credit for new music in America in the nineteen-sixties goes to Cage. There is no denying that. His celebrity was enormous and powerful. In 1968 I read a long and ugly interview with Stockhausen in a British music magazine in which Stockhausen accused Cage of "stealing" chance music from him. In Stockhausen's story he was working in his studio with Herr Dr. So-and-So on chance music; Cage visited the studio and got the idea and claimed it for his own. And that was followed by attacks on Cage in books by Boulez. This shows how celebrity is so envied and potentially hurtful. Stockhausen was nuts. Boulez is an opportunist. Cage must have been hurt by these attacks from his former friends, whom he had championed so much in the United States, when nobody had ever heard of them. But no, I was not influenced by Cage in matters of musical composition, for reasons I have explained above. Nor were most of the composers whose work I admired -- for instance the composers who are represented in Music with Roots in the Aether. We were influenced by Cage as a composer who took his work "on the road," when nobody else would play it, and who submitted to countless interviews, in a good natured and humorous style, about his compositional technique. We were influenced by Cage as a courageous person and as a spokesperson for contemporary music. Alas, Robert Ashley was not at the Vienna opening, but his son, Sam Ashley, was, since he's been an artist-in-residence at the MuseumsQuartier since Jan. 1. His work, Freedom From Happiness, score with instructions and eight-channel sound, was presented in an outdoor installation in the MQ's TONSPUR Passage. Happily, Sam will be back on native soil in time to appear in the upcoming production of Robert Ashley's CONCRETE (THE NEXT GENERATION) at Roulette, on Wednesday, April 25, 8 pm. MEMBRA DISJECTA FOR JOHN CAGE: Wanting to Say Something About John will be on view in Vienna until May 6, 2012. Click here for a slideshow of images captured at the February 17, 2012, opening. The show will travel on to the DOX Centre for Contemporary Art in Prague (June-August 2012) and to the Galerie vytvarneho umeni in Ostrava (December 2012-March 2013). Radio Music - Impossible Beyond 2017? In September 2012, Peter Urpeth will lead a concert at An Lanntair, Stornoway, to mark the centenary of the birth of John Cage (Sept. 5, 1912) and the 20th anniversary of his death (Aug. 12, 1992). The program will include a performance of Cage's Radio Music (1956), a piece that is to be performed as a solo or ensemble for 1 to 8 performers, each at one radio. Also on the program will be Cage's Music for Piano 26-36 & 37-52 (1955), Music for Piano 69-84 (1960), 4'33" (1952), and Imaginary Landscape No. 5 (1952) all receiving their first performances in the Outer Hebrides. "The poignancy of Radio Music is not simply in the fact that it celebrates the life and work of one of the most influential -- and to my mind interesting -- of musicians, but also because with the looming switch-off of the analogue radio signal in favour of the DAB type digital signal, it will be impossible to perform Cage's large oeuvre for radio (which includes Radio Music  and Imaginary Landscape No. 4 ) in the UK when the analogue signal is turned off for good in 2017. 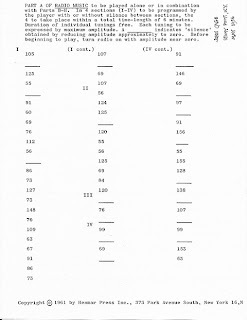 Cage's Radio Music requires multiple, precise retunings of each radio during the performance according to a set list of frequencies (with some periods of silence), which do not change according to the geographical location of each specific performance and which therefore enables chance and random soundings to occur. 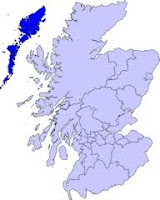 In the Outer Hebrides we have access to very few radio stations even on the analogue signal, so a great deal of the performance here will consist of the white noise blur of the FM/AM radio spectrum. The simple fact is that the sequence of retunings cannot be achieved on the DB digital system. With digital radio you have all the available channels or none, and you cannot select an individual frequency to listen to if it is not part of a digital package. A kind of performance could be achieved with different frequencies on the civil scanning systems of transport, emergency service, and CB radio signals, but the chance flirtations with popular music and speech radio in Cage's original will no longer be available. It is my hunch that Cage might not have objected to this threat to his music, other than in the loss of a major domestic source of random noise. Digital is bringing us closer to silence, but a sterile kind of featureless silence. I'd go further and say that just as in Freud death is the real state of being and life a false interlude, so in Cage's music, noise longs for silence, and slowly Cage's music is returning to silence. So, whilst it would be a beautiful act of futility to ask David Cameron to ensure the continuation of the analogue signal beyond 2017 for the sole purpose of enabling performances of Cage's music or as a resource for experimental musicians I think the gradual drift to silence of these pieces should be embraced." Urpeth is inviting others to join him next September in Stornoway for a celebration of Cage's work, and especially Radio Music, which he sees as "a threatened form of noise and music." He has no money to pay anyone, but he guarantees a great time (and perhaps accommodations). You can signal your interest by leaving your email in the comment box at his blog (link above). If there are more than eight who express interest, he will consider programming Cage's Imaginary Landscape No. 4 (March No. 2) (1951) for 12 radio performers as well.